Rare Bird Books, 9781945572043, 144pp. How do you find beauty and meaning in the most ordinary things when your life is being pulled away from you by the most extraordinary circumstances? On May 4, 2013, Cat Gwynn found a sizable lump in her right breast. Ten days later the acclaimed photographer was diagnosed with Triple Negative breast cancer--a disease long feared. Her mother had succumbed to breast cancer after a five-year battle. Now it was Cat's turn to live with it. This meant sitting with mortality, difficult side effects, and every other uncertainty being thrown her way. As the treatment protocol intensified, her immune system became more compromised, requiring limited exposure to the world around her. Cat mapped it out: her day-to-day existence was now reduced to about a ten-mile radius. Surrendering to this confined reality, Cat decided to engage in a daily practice of seeking out images with her smartphone that would connect her to the immediacy of life. There was no filtering what she found, only a genuine curiosity to see things as they were and how she chose to frame them. Every thing, detail, and day mattered, all inspiration for mindful expression. Cat didn't set out to make an art project about her experience with cancer, but over time realized it was a conceptual way to show her quest for well-being and willingness to uncover aspects of the world that are normally overlooked. By being present with deep truth, she was opening herself up to her own healing and reclaiming life in the most profound way. Wellness is a state of being, no matter the circumstances you're dealt. 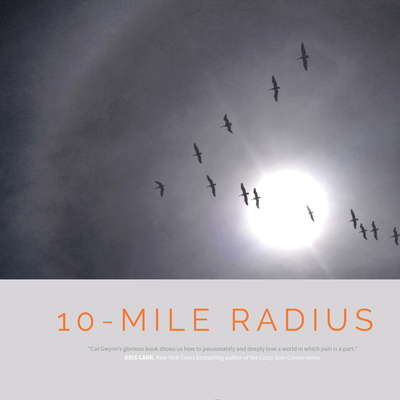 10-Mile Radius is a wake up call. A gratitude practice in motion that moves through limitations and becomes a compass back to one's self. Cat Gwynn was educated in photography, film, and fine arts at Otis- Parsons Art Institute, and has completed numerous master workshops with such esteemed artists as Mary Ellen Mark, Joel Peter Witkin, and Barbara Kruger. Her artwork is collected and exhibited in international galleries and museums including the Lishui Museum of Photography in China, The Drawing Center in New York City, the Orange County Center for Contemporary Art, and is sold through the Susan Spiritus Gallery. She has lectured at numerous institutions including Otis College of Art and Design, New York University, and Art Center College of Design. Cat's images have appeared on the cover of Artweek, and in numerous other publications including Artforum, Newsweek, and Texas Monthly. She is also a seasoned lifestyle and portrait photographer whose images have sold through Corbis and Getty Images for nearly twenty years. Her commercial clients include Apple Computers, Starwood Resorts, Discovery Communications, and T-Mobile. In addition, Cat has gifted her talents photographing pediatric patients for Flashes of Hope, a volunteer organization focused solely on funding research for children's cancer. Gathering the tools and techniques she discovered along her healing path, Cat developed 10-Mile Radius: Creating a Personal Map for Wellness, a powerful transformative recovery program which marries art-making into a daily mindfulness practice. She teaches the program at recovery and wellness centers, working with patients to co-facilitate a shift in their personal narrative. The 10-Mile Radius program is soon to expand into larger healthcare facilities.